One of the great unknowns in HIV/AIDS research is how much prevention bang you get for your treatment buck. Yes, antiretroviral (ARV) drugs make individuals less infectious, but how many people have to be on treatment to slow spread in a community and even bring epidemics to an end? A giant new study in South Africa failed to show any reduction in HIV transmission in communities even when nearly 50% of infected people received the drugs. When HIV-infected people take ARV drugs, it can stop viral growth so effectively that levels in the blood drop below detectable on standard tests. Several studies have shown that HIV-infected people on treatment who have fully suppressed the virus rarely transmit it to their sexual partners. In theory, as more infected people in a community start treatment, new infection rates should drop. Four big studies were launched to test this idea in different sub-Saharan African countries; a presentation in Durban, South Africa, at the International AIDS Conference last week revealed data from the first of these to reach completion. 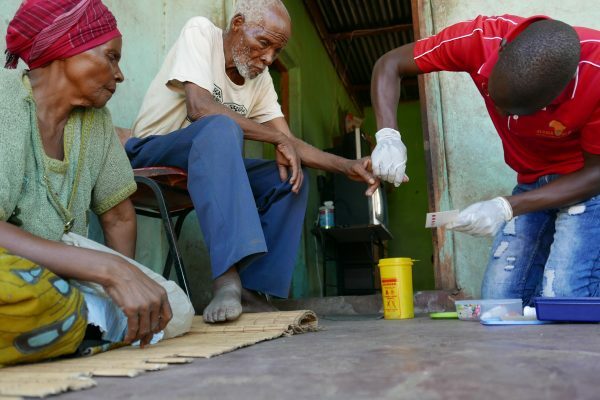 The study, called Treatment as Prevention (TasP), began in 2012 and enrolled 28,000 people in KwaZulu-Natal, the hardest hit province in South Africa. Sponsored by the French national research agency known as ANRS, TasP tested participants in 22 separate communities, which each had an HIV prevalence of about 30%, every 6 months. In one arm of the study that involved 11 communities, infected people were offered the chance to visit a study clinic near their homes and receive ARVs. Infected people in the 11 communities in the control arm similarly had easy access to a clinic, but they were offered the drugs only if their immune systems had evidence of damage from the virus as defined by government recommendations. As François Dabis from ANRS explained, less than one-third of the people who were eligible for treatment in both groups visited a clinic within 3 months, and less than half had at 1 year. Another 9% of the eligible people in the immediate treatment arm who went to the clinic opted not to start ARVs, meaning only 43% went on treatment in the communities that researchers had hoped would have every infected person taking the drugs. The 22 communities all had roughly the same rate of new HIV infections, about 2% per year. “Linkage to care was far from optimal and when it did occur, it occurred slowly,” Dabis said. Cohen says the TasP study was a carefully done, randomly controlled trial and shows that the real world has lots of complicated variables—like people learning their status and, for whatever reasons, not taking advantage of treatment. The study yielded an important insight, he says, because TasP “sets a bar”: Leaving aside the question of ending AIDS, treating 43% of the people in a community likely won’t have any impact on new infection rates. “We need to do a lot better than they did,” Cohen says. Next Post PBS NewsHour: The End of AIDS?